The internationally recognized scientist Cheikh Mbow heads the Washington, D.C. based organisation START International. His PhD "Remote sensing of fires in natural ecosystems" is from 2000, University of Copenhagen. Although he did not have any specific long-term ambitions as a child, Cheikh Mbow always did his utmost to do well. His perseverance paid off and he has come a long way since then. It would seem that it had always been on the cards that he would be successful and make an impact. 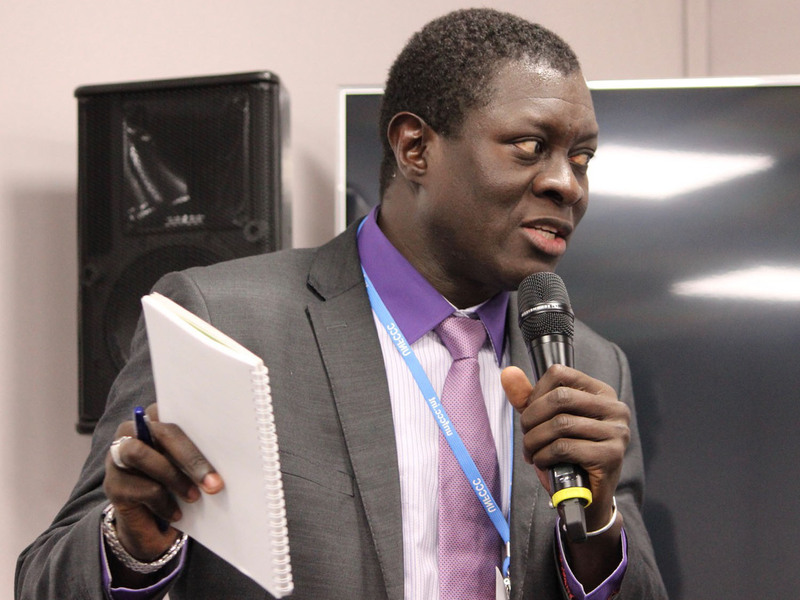 The internationally recognized scientist Cheikh Mbow, who heads the Washington, D.C. based organisation START International was born in Senegal in 1969 and grew up in a competitive environment where getting a good education and realizing one’s potential as an overall priority. I was raised in a family where academic achievements were highly valued. If you had the talent and the skills, you were expected to translate them into professional development. It was as simple as that, Cheikh Mbow explains. He did not disappoint his parents. Cheikh Mbow had a natural craving to learn and he worked hard. From primary school to high school, his grades were always amongst the highest in his class. At the Cheikh Anta Diop-Dakar University, where he finished his bachelor’s degree in geography in 1995, he received his first award. The following year, he was selected to take an advanced degree in environmental science botany at the Institute of Environmental Sciences-ISE in the Faculty of Science, also at Cheikh Anta Diop-Dakar University. He specialized in remote sensing. When two PhD opportunities abroad came up, one in France and one in Denmark, he was asked to apply. He chose the Danish option under Danida’s ENRECA (Enhancement of Research Capacity) programme. There are two reasons why I opted for the Danish PhD. Firstly, the scholarship was for remote sensing in forestry, the area I was interested in. Secondly, it appealed to me to take part in a programme like Danida’s that essentially was about strengthening scientific skills in Africa for Africa, he says. It also appealed to him that the Danes worked in English. Being from Senegal, Mbow is fluent in French. He wanted to learn English to broaden his horizons in order to work and compete with the best scientists internationally without being challenged by a language barrier. He never regretted his choice. From day one, Cheikh Mbow felt welcome in Denmark. On arrival at the University of Copenhagen on April 1997, he was given a master key that could open almost any office in the Geography Department, including his supervisor’s office. The open-hearted way I was received in Denmark was a shock, but a positive shock. I took the key and thought about it a couple of minutes. I then concluded that the Danes have a very trusting system that includes me as a foreigner, Cheikh Mbow says. 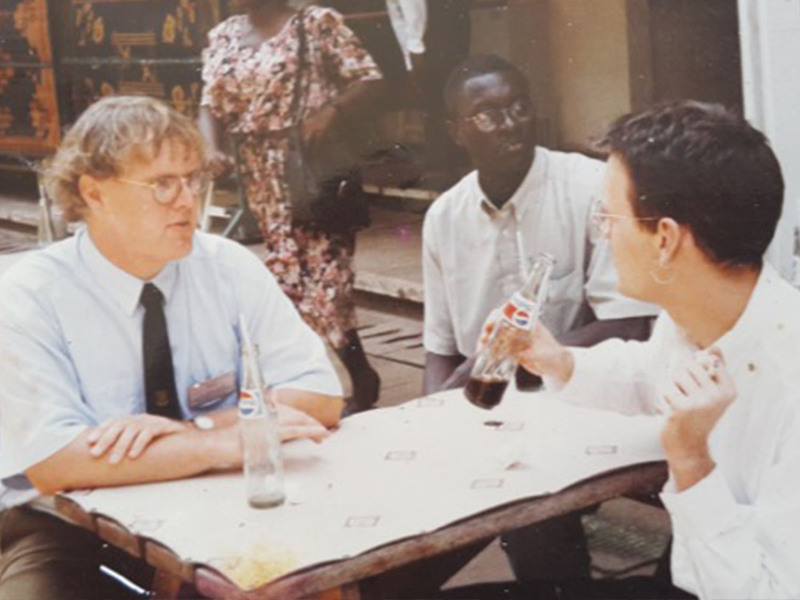 Cheikh Mbow with Danish friends Thomas Theis Nielsen (right) and Lars Møller-Jensen (left) in Ghana 1998. Photo: Curtesy of Cheikh Mbow. He explains that the trust gave him confidence. It was like being in an incubator: he felt embraced and supported. It made it easy for him to fully engage in the work of his faculty and concentrate on accelerating academically. Given the unique conditions made for him to perform, he took two lifelong lessons from his study time in Denmark. 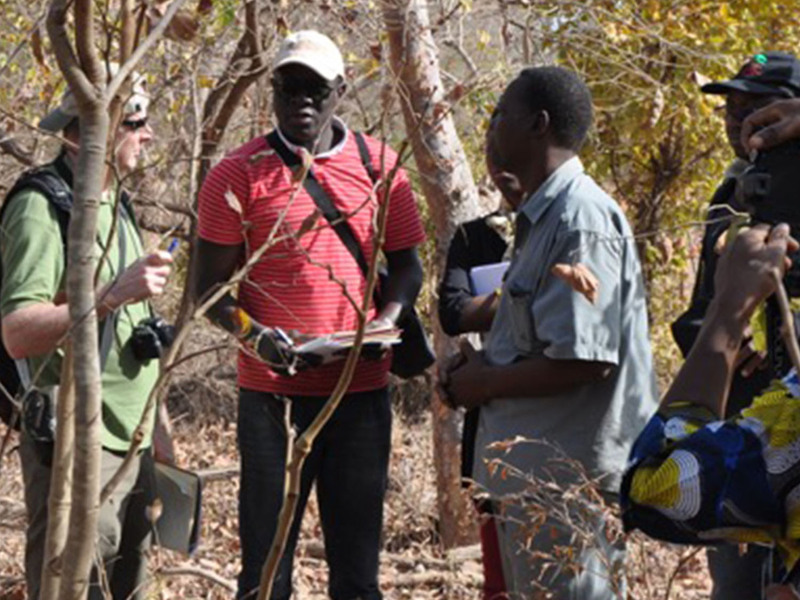 Fieldwork for his PhD research was carried out in Senegal, where he studied the impact of bushfires on biodiversity together with geographers from the University of Copenhagen. While studying a local Senegalese issue, they were using methods developed in Europe. It puzzled Mbow that these methods were being used as if they were universal. He soon realized that they were insufficient and that they fell short of fitting the local context precisely because they did not fully consider the specific local context. Forestry planning started in Europe in the 18th century. It is essentially geared towards efficient mass production of timber and falls short in a different biodiverse context where the forest has significance for the local population’s lifestyles and livelihood in a completely different way. In Africa, forest is not just “timber”: it includes ecosystem services and functions and cultural values that normative science assessments often fail to integrate thereby providing only a partial view of reality. It taught me a very big lesson that has followed me ever since. The creation of scientific knowledge must take the specific local context and knowledge into account. If it does not, it cannot serve as the basis for local policy and solution making, he says. After finishing his PhD “Remote sensing of fires in natural ecosystems” in 2000, Cheikh Mbow spent one year working at the University of Dakar-Senegal. He then moved on to do a post doc at Sherbrook University, Quebec, Canada before he returned to Cheikh Anta Diop-Dakar University in Dakar where he became Professor at the Environmental Science Institute. The objectives of the Danida ENRECA programme were to create this critical mass through fellowship and intra-Africa networks. Mbow is pleased to adopt a similar model in his new duties as the Executive Director of START. While in Denmark and long after his graduation, Cheikh Mbow had been involved in other projects beside his PhD. As is the custom in Denmark, the University of Copenhagen did not provide all the required funding for these projects. Together with his colleagues, Cheikh Mbow had to fundraise for the research projects to materialize. Hence, the second key lesson Mbow took from Denmark was that to be a successful researcher you must be able to raise funds. The Danish mentality is to use scientific research and knowledge gathering as a selling point to leverage funding that again enables even better projects and more robust research and results. So, when I came back to the university in Senegal it was with a mindset of a fundraiser, Mbow says. This attitude helped him and his colleagues raise funding to build a fully equipped and modern geoinformatics laboratory over a period of ten years. Believe me, the number of people who’ve been trained in the lab we built is outstanding. Most of them are now working at other universities where they are duplicating the same model, he says with pride in his voice. He mentions the International Foundation of Science, Danida, USAID and the African Development Bank among the contributing donors. In 2012, Cheikh Mbow decided to move on and pursue an international career. He became a senior scientist at the World Agroforestry Centre (ICRAF) based in Nairobi, Kenya. In 2016, he was appointed Executive Director of START International based in Washington, D.C. Since the time of his PhD studies, strengthening scientific skills in Africa and contributing to knowledge making and solutions that fit specific local contexts has never ceased to be the central focus of Cheikh Mbow ambitions. START International has given him a new platform from which to pursue his goals. The challenge, though, is different as it embraces a wider network and more complex portfolio of work. Cheikh Mbow on field trip in Burkina Faso. Photo: Curtesy of Cheikh Mbow. START addresses global changes, from climate change to urbanization, from deforestation to natural disasters, and it does so by providing African and Asian scientists with opportunities for research, networking and skills training. I took up the position with START because African and Asian research and knowledge creation takes centre stage in the organizational vision. True to START’s vision, Mbow is leading the organisation through a process that will increase presence in the regions, by establishing staff in Africa, reinvigorating connections with research centres in Asia, and developing regional partnerships and networks. For too many years, the belief has been that there is a lack of science in Africa and Asia. This new approach will help to correct that misperception. All the Asian and African scientist needs is a little bit of incubation, recognition and networking opportunities to contribute to solve the local and global challenges of our times, he says. Olman Segura-Bonilla, Danida alumni and former Cabinet Minister of Labor and Social Security of Costa Rica is a first mover and fierce believer in sustainable development economics. His impressive career and Costa Rica’s path of development are closely interlinked. I believe that Africa’s fastest route to social and economic transformation is through entrepreneurship, says Patricia Jumi, Danida Alumni and Executive Director and founding partner of GrowthAfrica. Patricia Jumi holds an MBA from Copenhagen Business School, which she completed in 2007 after receiving a Danida Fellowship for one year. When Hazem Hafez Ragab received an email that urged him to apply for a Danida Fellowship and a full-time MBA, he thought it was a hoax. But it was real, and the MBA made him realize that leadership starts with self-awareness. Non-communicable diseases are rapidly spreading in Zanzibar as in the rest of the world. Danida alum Omar Mwalim uses his Danish connections to try to prevent a further escalation. The time I spent as Danida Fellow was so valuable. My first experience of universal health coverage was in Denmark, Dr Tedros Adhanom, WHO Director-General said in his acceptance speech for the Danida Alumni Prize 2017. The award ceremony was part of Danida Fellowship Centre's 25 years celebrations in Frederiksberg. The recent war in Northern Uganda was all-encompassing destructive. To heal the wounds and move forward, Psychologist and Danida alumni Henry Oboke has created a small army of Village Helpers. They provide basic problem-solving therapy and help to self-help at household level. Doing business in Africa is challenging and rewarding, says Robert Leo Maslamoney, Managing Director of Maersk Line Angola. In 2012 he graduated with an international MBA from Copenhagen Business School under Danida Fellowship Centre’s Emerging Leadership Scholarship Programme. Rich in taste and with a good sustainable story, TOMS EKSTRA chocolate plates were launched in Denmark in 2010. Meet one of the key experts behind the product: Ghanaian Margaret Owusu, PhD from University of Copenhagen. Like Denmark, Bhutan is concerned with preserving the environment and the livelihoods of it's people, explains Jigme Dorji, MBA, Aarhus University. He foresees business collaboration between the world’s two happiest nations. As the Country Director of the Population Council in Nairobi, Harriet Birungi still draws on her experiences from her PhD years at University of Copenhagen. Plastic in lakes and the sea is an increasing, big problem. Bahati Sosthenes Mayoma from Tanzania, found that 20 per cent of the fish by Mwanza in Lake Victoria had plastic in their gastrointestinal tracts. If you think that career paths as professional singer and scientist are incompatible, then you ought to think twice. 38-year old Danida fellow Nguyễn Đắc Khoa is living proof that the two career paths are complementary. 27 year old computer engineer, Daniël van Schouwenburg decided to change his career path and broaden his horizons. He went to Denmark in September 2010, three days after his wedding, to pursue a full-time Master of Business Administration (MBA) through the Emerging Leaders Scholarship Programme (ELSP) administered by Danida Fellowship Centre (DFC). When Lillian Tibatemwa-Ekirikubinza became a PhD student in Denmark she was prepared. From childhood she was a pioneer and expected to excel.